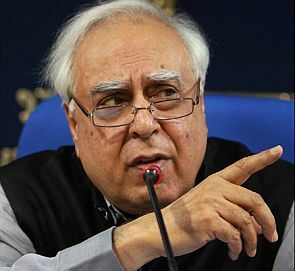 Alleging political vendetta in the National Herald case, senior Congress leader Kapil Sibal on Saturday accused Finance Minister Arun Jaitley of indicating to the Income Tax department issue of notice to his party in the case. He also rejected all charges of alleged cheating and siphoning off money by Congress in the matter. “Your finance minister in his blogs and on Facebook says this is an offence under Income Tax Act. He is the finance minister of this country. Does he have the right to make statements like that? He is giving a sort of indication to the IT department that you send notice. And what has stopping of Parliament got to do with the case of National Herald. It is nothing to do with it,” Sibal said speaking at the “Aaj Tak Agenda” programme. Congress has been stalling Parliament for the past few days over the issue of “political vendetta”. He said Congress is committed to reviving and running National Herald, a newspaper established in 1938 by Jawaharlal Nehru. “There was no cheating in the National Herald case. Young Indian is a Section 25 company that means no money can be shared with any of the shareholders. Nobody has lost any money or made any money in this,” said Sibal, a noted lawyer and a former Union minister. He said Congress wants passage of Goods and Services Tax bill in the Parliament but first government should accepts its three suggestions on the proposed legislation. “Parliament should function and we also want Parliament to function. One of a very senior BJP leaders set a democratic principle that obstruction in Parliament is part of Parliamentary strategy. “In the history of democracy, no leader has ever said such a thing. What have we said on GST? We do not want flawed GST. We have given them three suggestions on GST. We have said you come to us on the suggestions put forth by us and implement them,” he said. Referring to Prime Minister Narendra Modi’s comments that reforms meant for common men are being stalled in Parliament, Sibal asked, “When he was chief minister of Gujarat and for six years he was opposing GST, at that time was his feelings not connected with common men?”. Sibal said: “He (Modi) does Mann ki Baat everyday, we want he should do “dhang ki baat” (meaningful talks) also. When Modi, Rahul shook hands!